If there’s one thing I’ve come to realize since I started this blog, it’s that sometimes some of the best sandwiches you have just reveal themselves to you. For example, this past week I was researching sandwich shops in North Hollywood when I came across a place called the Cahuenga General Store. No one had ever recommended this place to me. I wouldn’t have just found it by driving my usual routes. Heck, I wouldn’t even have known it existed had I not done my research. But there it was, a little general store in a somewhat industrial part of town, hidden in a quiet neighborhood. Even the inside looks like this shop came straight from the wild west in the mid-1800s. Originally opened in 1995 as a place for film productions to rent props for period pieces, the General Store has moved on to sell delicious sandwiches, coffee, and baked goods to the locals. After salivating over their menu while researching, when I arrived I decided I would choose the Bleu Bird. This sandwich is packed with grilled chicken, bacon, bleu cheese, fresh slices of Red Delicious apples and glazed onions on a toasted French roll. I’m going to make a bold statement here, but this sandwich is absolutely, and easily, in my top 3 favorite sandwiches on this blog. With the first bite I was blown away by the flavor. The chicken was tender, juicy and delicious. The onions added a little bit of tang to the sandwich, while the combination of bleu cheese and thick apple slices was absolutely mind-blowing. The cheese and apples flavors complemented each other so well with the cheese added it’s characteristic flavor and the apples added a sweet, but complementary flavor. Combining all of these ingredients on a perfectly toasted French roll, it is like the Sandwich god himself came down from the baked bread heavens and handed this sandwich to man. Oh, and did I mention bacon? Yes, bacon. 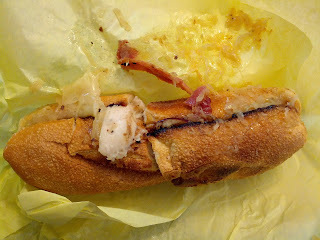 This sandwich is amazing, and is absolutely worth checking out if you are in the North Hollywood area. Well, now that I’ve had time to recover from this sandwich, it is time to move on and see what other sandwich surprises may come my way. 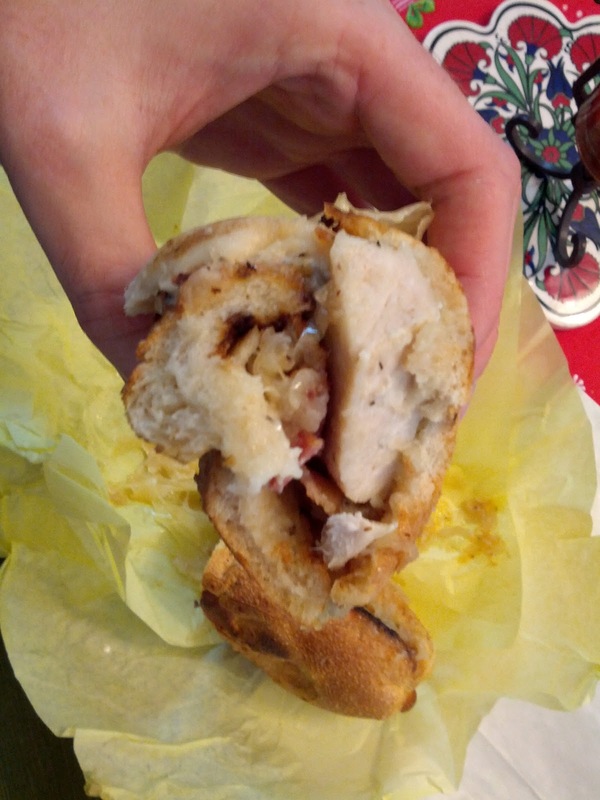 What sandwiches have you had lately, Dear Readers, that have blown your mind?